Utility fees include charges for water, sewer, garbage and recycling, and are sent out quarterly, as per below. Water and sewer are fully metered and you pay based on how much you use. You will receive a 10 per cent discount if we receive your payment on or before the due dates. There are many ways to pay your utility fees on time to avoid penalty. Find the option below that works best for you and never miss another deadline. Financial Institution: Most financial institutions offer the following payment options: in person, ATM, online or telephone banking. When making a payment through your bank, use the six digit utility account number as shown on the front of your Metered Utility Statement. Ensure that you are using the utility account number and not the folio number—payments made to a folio number will not be directed to the correct account. Each Financial Institution lists the payee (the District of West Vancouver-Utility) in a different manner, so check with your bank for details. Payments must be made on the due date by 12 a.m. Please retain your receipt showing the exact date and time of payment to avoid the penalty. Mail: Make your cheque payable to the District of West Vancouver. Payment must be received by the Finance Department on or before the due date to avoid a loss of discount. Postmarks are not accepted as the payment date, so mail your payment early. Lost or delayed payments by Canada Post are subject to a loss of discount. Post-dated Cheque: Drop off your post-dated cheque at the Municipal Hall, or mail it in early; we will hold your cheque until the date indicated. Drop Box: Place your payment along with the bottom portion of your Metered Utility Statement in a sealed envelope and place it in the mail slot located at the entrance to Municipal Hall (either the Fulton or 17th Street entrance). On the evening of the due date, the drop box will be cleared after 12:00 a.m. Payments received after the box is cleared will be subject to a loss of discount. In Person at Municipal Hall: Bring your Metered Utility Statement to the Finance counter located on the main level of Municipal Hall and pay by cash, cheque or debit card. Credit Cards are not accepted for tax and utility payments. The Finance Department is open Monday – Friday between 8 a.m. and 4:30 p.m. To avoid waiting in line at the counter, visit well before the due date. Post-dated cheques are accepted. Utility Auto Debit Plan: This is a voluntary program that authorizes the District to withdraw the balance owing on your utility account from your bank account on each due date. This program ensures you never miss a utility due date again. See below for details. Never miss the discount again. The Utility Auto-Debit Plan is a voluntary program that authorizes the municipality to automatically withdraw the discounted amount from your bank account on the due date shown on your Metered Utility Statement. There are four withdrawals each year. You will continue to receive a statement prior to each withdrawal. To enrol in this plan, simply complete the authorization form, attach a VOID cheque and return them by fax, mail, email or in person to the Finance Department 10 business days before the first withdrawal date. Additional Notes: Review the terms and conditions on the form prior to starting the plan. If you would like to cancel the automatic withdrawals, notify the Finance Department in writing and fill-out the Utility Auto Debit Cancellation Form. If you have sold your property, cancel your automatic withdrawals and consult with your solicitor. If your bank account has changed, complete the bank account change form. This plan does not include property tax payments. It is very important that we have an up-to-date address for you in our records to help ensure you receive your utility bills. If you are the property owner, utility bills will be mailed to you. The utility bill mailing address is the same as the property tax notice mailing address with the only exception being for strata properties which have one account for multiple property owners. Under these circumstances, the utility bill is mailed to the strata corporation or their appointed representative. If the mailing address on your utility bill or tax statement is incorrect, we require notification of the change in writing (changes of address provided to other District departments are not sufficient). Changes to a mailing address will update the address for both your tax and utility notices. IMPORTANT: Your change of address may not be reflected on your next notice, depending on the date we receive your change of address. Up to date information on your utility account is always available through MyDistrict. An owner may choose to add a tenant to the utility bill account. A written request must be received in our office and must include the full name of the tenant. A copy of the utility bill will be mailed to the property owner at the address provided to us. All utility bills remain the responsibility of the property owner and any amounts outstanding as of December 31st will be transferred to Arrears of Taxes and interest will be added from that time until payment is received. 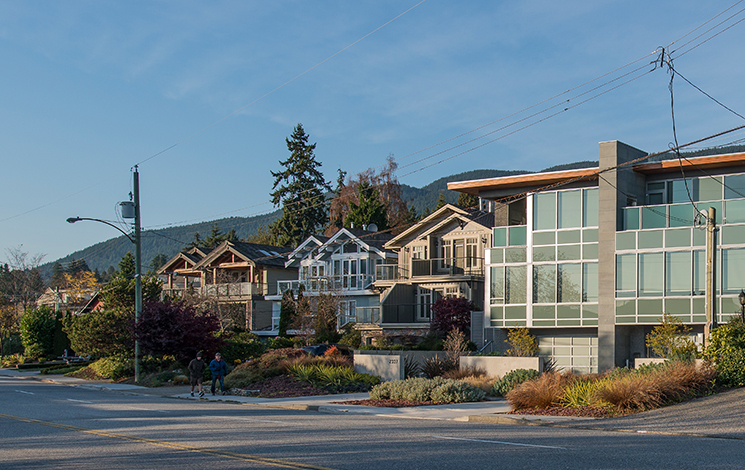 If you are purchasing or selling a home in West Vancouver, please ensure that a special meter reading on the property is completed prior to settlement. This will ensure that the water used by the previous owners is billed up to the completion date. The Special Meter Reading fee is currently $75, which will be included in your final bill and faxed to the solicitor. Typically, the seller's solicitor will arrange for a special meter reading. New owners should be aware that utility accounts never close and transfer with the property; therefore, a previous owner’s unpaid bill will become your responsibility. IMPORTANT: If you are enrolled in the Auto-Debit Payment Plan but have just sold your property, you must notify the Finance Department in writing to terminate your participation in the plan. Please complete and return the Auto-Debit Cancellation Form to stop future withdrawals for the property's utility account. If your request cannot be accommodated, you will be faxed or emailed a new reading date. The reassigned date will be considered acceptable unless we are notified in writing otherwise. If the meter is not accessible, an estimate will be provided. Did I make my utility payment? What were my utility bills last year? Can I receive my utility bill electronically? What was my water consumption last month? You are responsible for paying your utility fees whether or not you receive a utility bill. If you do not receive your utility bill, contact the Finance Department.